Sports injuries are common youngsters who actively play sports. These sports injuries may require surgery depending on the complexity of problem. Acute injuries: They are caused by sudden trauma. Common acute injuries include bruises, sprains, strains, fractures etc. Stress fractures of shin bone and bones of feet. Catastrophic sport injuries: Head and neck injuries are common in many sports, especially contact sports. They are common in wide range of sports such as wrestling, ice hockey, swimming, soccer, pole vaulting, gymnastics, cheerleading etc. Concussion: They are mild traumatic brain injuries. Football, soccer, ice hockey are the common sports that lead to concussions. Growth plate injuries: Injury to growth plates at the ends of long bones before growth completion may lead to bone deformity and disturbances in growth. These injuries are common in football, basketball, gymnastics etc. Prompt medical attention is recommended to prevent permanent damage or disability. 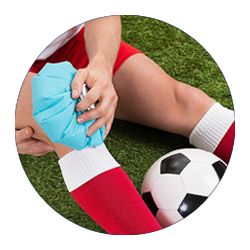 A detailed medical history, information related to the injury and clinical examination is done by doctor to diagnose the type of injury and plan appropriate treatment. Imaging tests, x-rays or other tests may also be recommended if necessary. Post-treatment instructions and regular follow-up visits are recommended by the doctor in order to prevent complications and speed up recovery. Sport injuries can be prevented with training and appropriate equipment. Use of right technique and position is key to prevent sport injuries. Proper equipment from wearing the right shoes to safety gear, avoid high impact injuries. Injuries can also be prevented when the athletes understand and follow the rules of the game and display good sportsmanship.